Note: We have re-organized our site to better accomodate our member's requests. Click here to check out our new "Let's Trade" page. *** We are currently looking for sponsors and venue hosts for our upcoming Pin Swap sessions. VANOC and was given to medical staff and personnel. Here is a story submitted by one of our members. 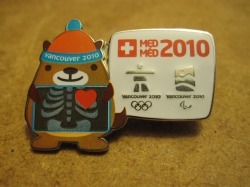 These are two of the most elusive and sought after pins of the Vancouver 2010 Olympic Winter Games. (1) It had to have both Olympic and Paralympic logos so it would be pertinent at both Olympic and Paralympic Games. (2) It had to have mascots, as they are always popular based on past experiences at previous Olympics. Mukmuk was the only mascot that could represent both the Olympic and the Paralympic Games. would be identifiable immediately as "medical" related. Mukmuk and the X-ray image was just a natural fit. (5) English and French are the official languages of Canada and for the IOC. Thus, utilizing the abbreviation of "Med" and "Méd" (Médecin translates to doctor in English). (6) The blue text represents the "blue jacket" volunteers. streets of Vancouver and Olympic venues, was incorporated into the background of the pin. were low in production and the Mukmuk supervisor pin was even less. and attention that went into designing them! Do you have a pin that you want to share, add your story and highlight? Submit you request here and if selected it may be posted on our website as our feature pin. I am extremely happy to announce that it's official, our website is now up and running! Our website allows our members to post pins for trading, buying and selling all in the convenience of your own home, work and even in a coffee shop. We are always looking for new members! We are a FREE club that eliminates the frustration of searching for other fellow Pinheads such as yourself and provides an online network that connects you along with other individuals in different cities and countries that you probably wouldn't have had the chance to meet otherwise. Our members range from junior and starter traders to advance traders who have collected for years. New members can join our club free of charge by going to our 'Join our Club' tab and registering online. We are constantly updating our website to better suit the needs of our members and thank you all for your patience during this time. If you have any comments or wish to provide us with any feedback, please go to our 'Contact Us' tab and submit your comments. We wish you all the best in the world of pin trading and we eagerly look forward to trading with you soon! Lucky Charms Pin Collection what is is today. plan future events and to keep our services free!!! Please email us to see how you can contribute or join our sponsor groups! Copyright © 2010 Lucky Charms Pin Collection. All rights reserved. If you wish to be removed from our distribution list, please click here and request to be removed. Should an email bounce back after three attempts, your address will be immediately removed from our mailout list. Unless otherwise specified, no personal information of Lucky Charms members will be disclosed. Lucky Charms Pin Collection does not take any responsibility for any transactions made. All transactions are strictly between the trader and tradee and seller and purchaser. Lucky Charms is only a free service that posts requests and provides a network for traders to trade pins. All transactions are at the sole discretion of the trader and tradee.